Harbor Patrol no longer manages moorings, which are sparsely used. REDONDO BEACH — The moorings at Redondo Beach’s King Harbor are rarely used. It might take a while before anyone notices the local Harbor Patrol is no longer managing the open-water boat parking system. A private firm officially assumed management control of Redondo Beach’s moorings on June 1. The management shift relieved the Harbor Patrol from mooring management duties; council members unanimously approved the shift at their May 23 meeting. Stephen Proud, Redondo Beach’s waterfront director, told council members it was the city’s intent to designate a private firm to manage the mooring field ever since it was brought online in 2014. The Harbor Patrol’s management of the mooring field was a temporary measure, Proud stated. Leonardo Management, which already manages Redondo Beach Marina and the harbor’s boardwalk area, was selected to manage the mooring field. 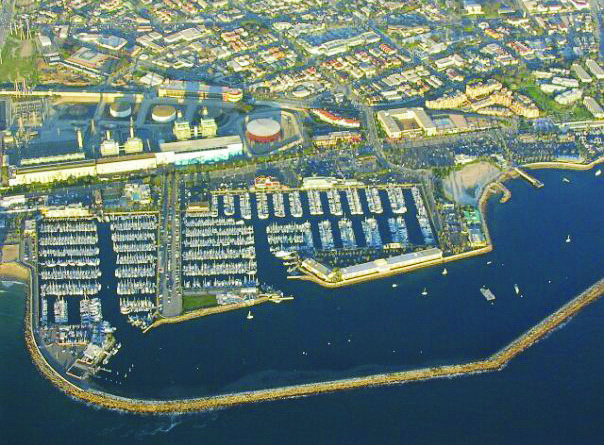 The management firm maintains an on-site staff at King Harbor and will manage all reservations and other mooring-related business, according to Proud. “The day-to-day presence of Leonardo staff in the harbor provides better coverage for inquiry calls and the ability to manage reservations on a real time basis. Staff feels that this improved on-site presence, coupled with an increased marketing push, can lead to an increase in the level of usage of the mooring field over time,” city staff stated in a report to council members. Moorings were installed at King Harbor in the fall of 2014 in an attempt to draw short-term cruisers to the Redondo Beach waterfront. Boaters were unable to moor in the harbor for the previous 25 years. The mooring field’s capacity is 25 vessels. Council members and city staff acknowledged the mooring field has not been used much in nearly three years of existence. However they also hoped Leonardo Management would increase interest in the moorings. “They are going to be making … a marketing push to start to increase awareness of the mooring field. That was one of the things that the Harbor Commission has been requesting of us,” Proud told council members. “Since the mooring field has been put in, there hasn’t been the utilization that everybody hoped would occur. It just hasn’t been utilized as effectively as it could be. An online reservations system could also be in the works, according to Proud. Mayor Bill Brand told city staff and his colleagues he wanted to keep an eye on the mooring field’s maintenance costs and revenues during the next few years. The field could be removed if moorings continue to be lightly used and costs associated with maintaining them are high. July 2016 was the busiest month on record for Redondo Beach’s mooring field; 22 mooring reservations were made that month. Mooring use has been in the highest demand during the summer months of July, August and September, according to data released by city staff. City staff specifically reported 46 reservations during the July-September stretch of 2015; 39 mooring reservations were made during the same time period in 2016. In all, 202 mooring reservations were made in the 28 months since the field became operational, according to official data. But we were able to “anchor,” for free, for the past 25 years. The paid moorings just replaced one of the last free anchorages in Southern California. If you have to pay, you might as well get a slip. I’m speculating that’s why there is no interest in the moorings. Same thing as the moorings off Island White in Long Beach. Great idea to make money, but in practice it doesn’t work. I also speculate the harbor police were too lazy to administer the anchorage as an anchorage. I know the one time I anchored there, on my way down the coast, and in need of a break due to exhaustion, they didn’t seem too happy to see me. But, I admit, they did let me anchor.